Note: Lamos is not actually Spanish for limes. This is an inside joke. The Spanish word for lime is actually lima. Christmas of 2009 I got DH a lime tree. Someday, he’d like to have an orchard. He dreams of a place where plums and citrus, apples and almonds, avocados and olives all live in happy harmony with the climate. Until we discover such a place, his orchard (currently of the potted variety) must enjoy our Central Texan Climate. Bill, the lime tree, hails from Lake Jackson, Texas. I found John Panzarella online, gave DH a coupon for Christmas for one trip to Lake Jackson to pick out a tree, and that January we were on our way. If you live anywhere near Lake Jackson, and have any interest in purchasing a citrus tree – you need to visit this man. He makes trees that grow lemons that taste like oranges, oranges that look like limes, limes without acid, pummelos, kumquats, and has an avocado tree larger than I knew they could possibly grow. He had fruit that I hadn’t heard of before, and have since forgotten the names of. All of it growing in his well-tended, greatly-loved, suburban backyard. The first year with Bill, we got about five limes. He got a little spindly looking, so in an attempt to encourage branch development and leaf production, last January when he started to bud, we knocked off his flowers. He didn’t make a single lime last year. He did, however, grow a few new branches with a lot of leaves. This year? He seems to be making up for it. This photo hardly shows all of the blossoms visible from this angle – nevermind that this is only half the tree! I wish we could put him out side again already. The honeybees adore the sweet blossoms (which smell like limes) and could likely use the nourishment this time of year. Unfortunately for the bees, we’re not yet into our frost-free time and so they must wait a few more weeks. The buds start out small, round, and green. As they grow, they blanch into little popcorn-looking buds. Finally, they open into flowers only to have the petals fall away and a baby lime with a yellow nose appear. I do think that this year, for the first time, we may end up with more limes than we know what to do with. Lime sorbet, perhaps? Lime juice ice cubes for drinks throughout the summer? I’ll have to look up some more ideas. Right now, Bill is in a sizable plastic pot. This is his third pot while in our care, and it keeps him at about five feet tall from pot bottom to tree top. While we would love it if we could plant Bill out and let him grow ever larger, there are occasional freezes here that would put an end to Bill all together, so he must stay small enough to be carried indoors for 3-4 months of the year. DH does want to see if we can prune him short, but allow him to gain some strength and heft, by increasing his pot size once again. To that end, DH put together a quick project. Step 1: Buy a barrel cut in half. These are from the Jack Daniels distillery in Eugene, Oregon. Having lived in Eugene previously, I wondered upon discovering this fact if they were any cheaper directly from the source. After factoring in travel, I was actually kind of surprised (and glad) they were priced at $30 each and not higher. Step 2: Drill drainage holes. This will prevent root rot for larger plants planted in the planter. Set the barrel on its side, brace it so it doesn’t roll away, and drill handle holes. The pot Bill currently lives in has no handles. When full of a tree and the soil necessary for the tree, nevermind if that soil happens to be moist – the pot gets heavy enough to bend the plastic when being carried from spot to spot. Thus the need for handles on an even larger, heavier, pot. Buy some strong, thick rope. Cut to length. Thread through the handle holes, and knot off. When cutting the rope to length, remember to add some length for the knots, as well as enough rope that when you lift the handle your knuckles don’t bump against the barrel. I had originally thought two handles per barrel half would be perfect. Each person has a handle with which to carry the pot. DH had a better idea. Things I learned that day: Two people, four hands, four handles. The plan was to move Bill from his current pot into one of these when he made the move back outside. However, with the level of joy Bill is showing off through flower and fruit production in his current pot, we won’t be rocking the boat. So until next fall when we do swap pots, these will likely house some flowers, a few herbs, and hang out by the grill on the patio. It was 88 degrees on Thursday. Today was a high of 63. It’s supposed to be 40 tonight. Seasonal changes where I grew up in the Pacific Northwest of the United States were gradual. Days slowly got drier and warmer as they got longer in the spring. In the fall, they slowly lost daylight hours to night hours as the temperatures mosied down the thermometer until winter. Texas is different. Central Texas is a fan of a 40 degree temperature drop in a matter of hours. A cold front comes in and that’s that. The humidity is pushed out, the sky clears, and the temperatures plummet. Thursday, I took my tomato and pepper sprouts outside for the first time and worked in shorts and a tank top and was warm. Today, I was in jeans and a tanktop while shoveling a cubic yard with DH. Tonight, I’ll be bundled in pants, long sleeves, a jacket, hat, scarf, and gloves. Oh, how the winds change things. Each year so far I’ve forgotten how the peppers stay small for so much longer than the tomatoes do. These tomatoes were the usual little leggy sprouts in a tray, that got planted up to their necks about a month ago. Here they are, ready to be buried once again. What else is the weather doing? It’s bringing things to life. This is June. (We name things in our household. Not all things, but more things than I think most households name.) June is a grafted plum tree. She houses four varieties on her delicate limbs. She came from Raintree Nursery late last spring. June thinks it’s time to bud, and it very well may be. Each year for the last few years DH and I have gone camping for our anniversary. It gives us a chance to be out in the quiet wild of the world, spend time with each other away from the laundry (but not the dishes), away from the world of now-now-now, away from cell phones, laptops, work, and people, and just be. We had planned to go this weekend, and oddly both of us, as we were set to start packing the car, looked at one another. I didn’t really want to go. He spoke up. “Do you really want to go? You don’t seem that excited.” I wasn’t. It turns out he wasn’t either. So instead we’re doing some homesteading/nesting for our anniversary weekend. Part of that is putting in some serious labor on the new garden plots. Yesterday, DH spent a couple of hours turning the rest of the Left Bed to aerate the beaten down, lifeless soil. I followed behind on a beam of wood that distributed my weight evenly so as to not re-compress the soil, pulling out bucketful after bucketful of weeds. We even found a potato and a beet the previous gardener had left behind! For some reason, our dog, T, thought that potato was the most fun that could be had at that moment and spent the next twenty minutes tossing it into the air to himself, chasing it down, and tossing it again. Today, DH drove us in his little truck to Whittlesey’s for a cubic yard of soil. We ended up getting their Austin Soil Amendment. 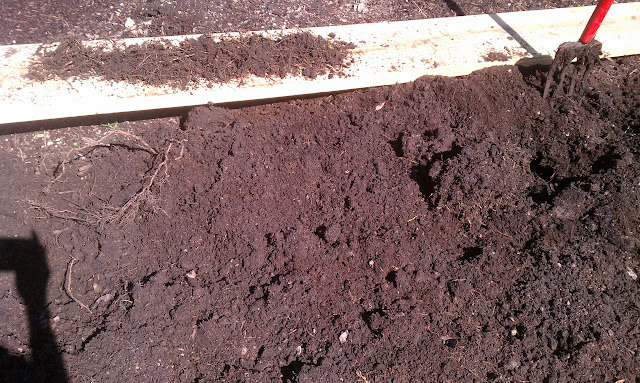 66% organic compost, sand, and other nutrients to help feed the earth and break apart our dense clay. The mix sparkles ever so slightly in the sunlight. We spent the afternoon with two shovels, a wheelbarrow, and a lot of back muscles. With a little final work with a hoe and a rake, the mix was spread evenly across the 200 square feet. Tomorrow will be a trip to the lumber yard for enough 2″x6″ beams to make two foot-wide paths twenty feet long. When those are in place, I’ll turn the amendment into the soil, sow a couple hundred drying beans, water, and move on. Move on? Well, yes. There’s a-whole-nother 200 square feet that needs to be weeded, turned, amended, and structured. That bed needs to be finished next weekend so the tomato and pepper plants can settle into it before the heat really comes to stay for good. It’s about three weeks earlier than I normally would put out the beans, but with the weather we’ve been having…I’ll take my chances. This year, one of my goals is to better manage my space through timing. I spent a fair bit of this past fall and winter with more bare ground than I would have liked. I didn’t plan well enough, but it was my first year-round garden attempt. Learn, adapt, grow. Early beans will help with this. If I sow them now, they’ll be little plants by the time I pick the greens in their space. This is my backyard 100. Last year about this time I was busy each evening working foot by foot, inch by inch, to turn the sod installed and left alone since ’85 into a fertile plot of loose, lively, vibrant soil. The soil in these parts is usually one of two types – nutrient-void clay or limestone bedrock. I’ll leave a history of that transformation for another day. Today, it’s beans. – Kebarika is in the foreground. They’ll make their way into soup and such as dried beans. – In the middle is Selma Zesta. It’s a new attempt at a green bean variety. – In the back we have Potomac. These beans felt magical when they touched my hands. Like they carried their hundreds of years of ancestry inside each one. I was glad to’ve selected these. I tend toward a dense-planting style, but not Square Foot Gardening (unless entirely by accident.) I learned a lot on spacing from The Sustainable Vegetable Garden. So far, I’ve had good success with most of their spacing guidelines. I did have a spacing issue with some zucchini on 15″ centers last year (they got about 24″ in diameter) but really like the spacing they recommend for beans – six inch centers. I like using my Hori Hori to sow seeds. It easily measures both planting depth, and spacing, by the marks along the blade. And then sometimes, I just get lucky. These lettuces were some of the ones that volunteered in my lawn after I pulled the bolted plants from the spring beds. I moved them into the bed months ago, and now they’re huge! We had some of the romaine with dinner the other night – delicious! 2011 marked the worst drought on record, by more than double the 2nd worst drought on record. As such, I will not complain about rain. No matter the amount, the frequency, the clouds, or the cold. We need it. I’m grateful for it. I can almost hear the trees sigh in pleasure from it. It did, however, put a damper on my Saturday plans. 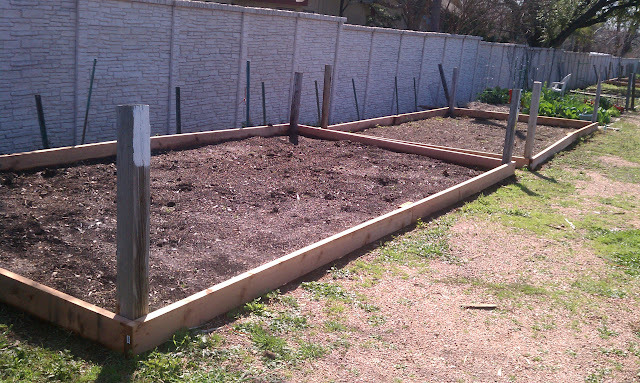 I had planned to spend most of the day on Saturday out in my new community garden plots. Turning the earth. Aerating. Amending with manure. Enjoying the air. Acquainting myself with the soil. Instead, I spent the morning at breakfast with DH and his mother before trekking to the Farmer’s Market to pick up some more red carrots, beets, kale, and mushrooms, among other goodies. Upon arriving home, I promptly fell asleep for an impromptu nap. Awoken just in time for some dinner before a movie date, and that was the day. Sunday, however! Sunday broke to clear skies, warming air, and a soft and cheerful breeze. I downed my breakfast of market finds sauteed in bacon grease (complete with duck egg, a first for me!) and started loading. I still had maybe a 1/3 of a cubic yard of farm manure left over, and began shoveling it into the wheelbarrow, wheeling it to the truck, up a ramp, and dumping it onto some weed cloth. When most of it was in the truck, I loaded up my tools, my water bottle, and my gloves, and took a short drive to the gardens. Those, dear readers, are my two new garden plots. 10’x20′ each. On days where I don’t need to haul manure, I can walk to these gardens from my home. They’ve allowed me to quintuple (quintuple!) my garden space for 2012! I can’t stop smiling when I think about what that means. The one in the foreground had a gardener last year. According to the gardener of the neighboring plot (not pictured) my predecessor was a bit angry of a lady. The soil appears to have taken the brunt of her anger. It is compacted. It is lifeless (I found one little earthworm, a mere two inches long, in 30 sq ft of digging.) And while the bed may look mostly cleared out in the photo, do not be fooled. (I was fooled.) It is not a weed-free bed. It is a weed-full bed…covered in mulch. The bed in the background, according to the same neighboring gardener, was weeds all last year. I was worried when I heard this. However, upon first touch, the soil is lovely. It’s loose, crumbly, and soft. That has never happened for me in a new-to-me garden bed in Texas. With those as my starts, I started in on the harder undertaking. It was time to show the soil in the foreground some love. It was time to see if I couldn’t breathe some life back into it. And with that in mind, I got to work. I believe these are tomato roots? I can’t say for certain. Since I can’t say for certain, they must come out. Nevermind that it will take me six times as long to do. People usually don’t believe me when I tell them I only weed my gardens a couple times a year. This is the work that must be done to get to that stage. My dad used to say that things worth doing are worth doing well. If it’s not worth doing well, it’s not worth doing. The more work I do now, the less I’ll have to do in the future. The future is a lot longer than the now. And so, after three hours of re-shoveling manure into a wheelbarrow, down the ramp, and into the beds, followed by 30 sq ft of earth turning, root sifting, and deep root pulling, I was hungry and it was time to head home. I’ll make it out again tomorrow evening (tonight is Mini Tri Training) and hopefully again Friday morning. This weekend we go camping for our anniversary, so Saturday will once again be full of other things (like campfires and swimming!) Sunday, however, should have a few more solid hours of root-pulling in store. I think tomorrow evening, I’ll be planting beans in my home-plot. Three weeks early, yes, but with a high of 81 on Thursday and the lowest night temperatures only hitting 42 for the next ten days…I’m feeling like taking a risk. Work has been taking up all of my daylight hours, some of my hours of darkness, and nearly every ounce of energy these past two weeks. I haven’t been in the garden at all in over a week, and miss it. I’ll be taking a wander around the bed at home to pull volunteers this afternoon. I have some serious Garden Time planned for this weekend. Hopefully the planets align. Oh, wait! I looks like the larger pointed-leaf specimen in the foreground, which looks more like…yep! Another two Texas Hummingbird Sages! Of the two in the middle, the one toward the top right is a different fellow. His leaves are smaller and more frequent. I touch them and bring my fingers to my nose. I inhale the sweet tangy aroma of Oregano, and know that the prolific seed production of this past fall wasn’t for naught. Depending on how many of each of these herbs end up sprouting where they are, I may end up transplanting a few into pots for the patio to add hunger-inducing smells, handy herbs for grilling, and pest deterrents for the yard. As a result, the grasses that sprout up as weeds in my beds have different rooting habits and thus require different types of removal. This kind of grass, is easy to remove. It grows low along the ground in a spoke pattern, and by wrapping all blades together into one strong rope and gently pulling, it comes out by the roots. Rarely will it return in the same spot. The other main grass culprit around here is a real tough one. It looks nice enough. The spoke grass is in front of the little white bowl. The mean one is along the concrete wall. I call it Lizard Nut Grass. Why such a silly name? Well, when you pull it up, all of the grass blades release from the root system, not unlike a lizard’s tail pops off when pulled. By digging down for the roots, you discover it really is only one long, thin, dainty root, which will happily also snap under pressure. No problem, right? You got the root, it should be done? I wish. At that point, we get to the “nut” part of the name. If you keep digging down, following that single root string, you’ll find a little “nut.” This nut will gladly send up another root string, with more grass, and another root string, with even more grass. Until I can find that nut and throw it away, the grass will continue to grow back. Over and over and over. Really great persistence if you want grass in one spot for a really long time. Oh, did I say one spot? Yeah, so that nut that’s under ground? It’s about six inches down, usually. Not only will it send up the root string to make grass, it will send out sideways strings to make other nuts! And what’s worse? It will send a root string DOWN and make another nut anywhere from 12″ to 18″ below surface. In the middle of a bed, I can usually eradicate this grass with some serious spade fork, shovel, and hand-sifting-through-the-earth action. So long as I’m thorough, work slowly, and do it two or three times per bed, I find all of the nuts and throw them away. Wherever the bed meets with concrete, however…I am not so successful. The nuts find their way UNDER the sidewalks and THROUGH concrete cracks. No matter how much I may be determined to dig them all out, unless I invest in a jack hammer (and am willing to part with my sidewalk, or garage foundation) I am not going to get a grass-free bed – and that’s ok. I’ll just continue to pull the little grass tails off at the surface and toss them on the lawn. This isn’t including the actual St. Augustine grass that sends out runners, that send down roots, or the wiley-yet-to-be-named-by-me grass that is soft and feathery in growth pattern, but also invasive. Clover and Horseherb – Friends and Foes. Can you spot the weed in this picture? This type of clover will send up quite lovely little yellow blossoms later in the spring. Unfortunately, it will take over if given the chance and therefore must be pulled. It doesn’t like being pulled up, and will usually snap off at the surface. Depending upon your level of tenacity, you may let it go until it sprouts again, or may go digging for the roots – it’s up to you. The weed in the first photo is actually a native called Horse Herb. People apparently buy this plant on purpose. Nevermind that the first result when searching for “Horse Herb” is for a post entitled “I Hate Horse Herb” by Zanthan Gardens. I sympathize with their sentiment. Please don’t buy this plant on purpose. You’ll regret it unless you don’t want any other plants on your entire property. Really. Here it is attempting to take over the gate’s space in the fence. I’ve ripped this bunch out twice already. “Native” doesn’t not necessarily equal “Good.” Just because the plant has been around these parts for ages, and is well-suited to local conditions, does not mean it’s a good idea to bring into your space. If you see a weed when it’s small, don’t come back to get it when it’s bigger – pull it small! The smaller the weed, the smaller the root. The smaller the root, the closer to the surface. The closer to the surface, the easier to pull. Bed prep really is worth it once again. I re-learn this lesson every few months in a new way. When I ripped out 100 sq ft of lawn last February to put in a garden bed, I did more than just remove the grass, build a bed, and fill it with soil. I dug that sucker 24″-30″ deep, removing every grass, clover, horse herb, henbit, and other bit of not-vegetable-life root system I could find. The result? I rarely have to weed my vegetable bed. Rarely meaning…every three months or so I go through and pull out about five weeds. Two of which are stinking Lizard Nut Grass, which I pull every time to no avail. They seem to stay dormant when the bed is empty and I would be able to go digging for the nut. Instead they sprout up when surrounded by food-plants I don’t want to disturb. Wiley little things. The other weed I commonly battle in this yard? I think it’s wild carrot. I could be wrong. Nevermind the dandelion. I find those fun to dig up. These weeds grow like a blanket and will send up a shoot for a bunch of teeny tiny little white flowers to bloom upon. Those flowers will turn into cockle burs. They behave not unlike Queen Anne’s Lace, but are not nearly as majestic as that childhood favorite of mine.